Billy J has been a wrestling fan since he was 5 years old..
Billy J’s favorite wrestlers at the time were Hulk Hogan and Junkyard Dog..
Billy J has attended many WWE houseshows, 3 RAWs, 2 WCW houseshows, and a WCW Nitro..
2001: Billy J decided to get into pro wrestling..
~~~Billy J joined a pro wrestling club (CFWA) at his university (University of Northern Iowa)..
~~~Billy J quickly learned to become a pro wrestling referee..
August 2001: Billy J. refereed his first pro wrestling show for CFWA..
Octobter 2002: Billy J. started refereeing for New Era Wrestling..
November 2002: Billy J. started refereeing for Impact Pro Wrestling..
May 2003: Billy J. started refereeing for U.S. Wrestling..
Billy J. has refereed all kinds of matches: Battle royals, TLC matches, Gauntlet matches, Ladder matches, for example. Billy J. has reffed several shows and several main events..
~~~Usually he’s the only referee on the show..
~~~Billy J occasionally works with another referee on the show..
~~~Billy J works 8-10 matches a night on average..
August 2003: Billy J. reffed 2 shows with WWE announcer, “Mean” Gene Okerlund, and Sonny Onoo.. Favorite wrestlers at this time: Triple H, Ric Flair, Kurt Angle, Chris Jericho.. 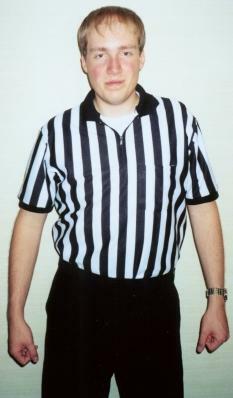 Favorite referees: Earl Hebner, Charles Robinson, Nick Patrick, Chad Patton.. Highlight of career: Reffing with “Mean” Gene Okerlund and Sonny Onoo..
Billy J has been trying his hardest to reach his dream to become a WWE referee soon..
Billy J has been contacted by WWE and is waiting for an available position in the company..
April 23, 2005: Billy J reffed ROH Champion Austin Aries for Impact Pro Wrestling in Delta, Iowa!